Viral video fame giveth, and viral video fame taketh away. You might remember Courtney Barnes, who tried to become a viral video sensation last week, by giving a ridiculous interview following a car crash. All of that attention really backfired on him. 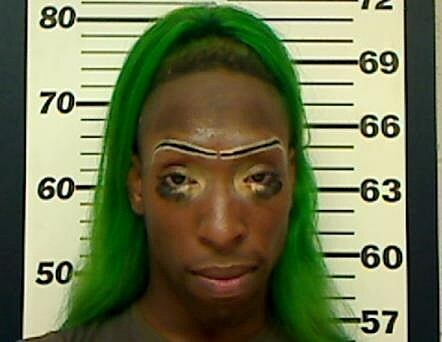 He's a flamboyant character with a big personality, green hair, green fingernails, and a drawn-on unibrow. It turns out the police have been looking for him because he has two outstanding warrants in Jackson, Mississippi for shoplifting. One from Walmart and one from a clothing store called Swell-O-Phonic. So thanks to the viral news video, the cops knew exactly where to find him and they just arrested him. Here's the video of the interview that made Courtney a viral hit.